Aircraft Spruce Canada can provide Transport Canada Approval certification on request for products to be installed on certificated aircraft. Customers who need this certification will be able to obtain it from Aircraft Spruce Canada at no additional cost. 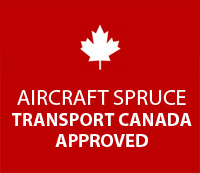 As an approved distributor, Aircraft Spruce Canada is committed (under the approval procedure) to stock and supply to owners of certificated aircraft only those materials and spare parts for which certificates of conformity were received and for only those products traceable to sources of supply acceptable to the Minister. The conditions and requirements set forth for the approval of persons engaged in the distribution of aeronautical products were developed with the cooperation and assistance of the Canadian Aviation Distributors Association (CADA) and the Aerospace Industries Association of Canada (AIAC). Please request your Transport Canada approval stamp for eligible products when placing your orders with Aircraft Spruce Canada.